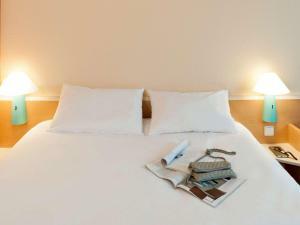 This 100% non-smoking hotel is located in the heart of Berlin, a 7-minute walk from Potsdamer Platz. ibis Berlin City Potsdamer Platz has its own parking garage and is a short walk from the Brandenburg Gate and the Reichstag parliament. The reception and bar at the ibis Berlin City Potsdamer Platz are open 24/7. Hot and cold snacks are available around the clock. ibis Berlin City Potsdamer Platz is committed to sustainable development and low carbon emissions. 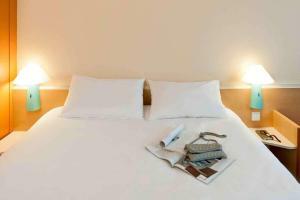 The modern rooms include free WiFi, high-quality beds, a desk and a private bathroom. Breakfast is available between 04:00 and 12:00 daily, and guests can help themselves to the breakfast buffet between 06:30 and 10:00. 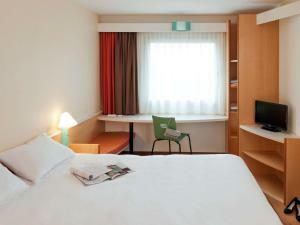 This ibis Berlin hotel is less than 50 metres from Anhalter Bahnhof City Rail Station. The Potsdamer Platz underground and S-Bahn (city rail) stations are just one train stop away. Checkpoint Charlie is 800 metres away. Please note that bookings without credit card details are only guaranteed until 19:00 on the day of arrival. 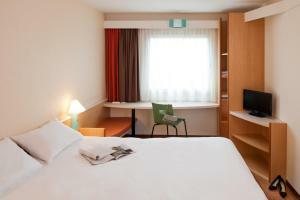 Spacious non-smoking room with large beds and contemporary décor. This barrier-free room offers air conditioning, a comfortable bed, free WiFi and a flat-screen TV with a selection of Sky satellite channels.